in different fields of study for Masters, and Phd. you can apply for BS - Bachelor of Science, BSCS - BS Computer Science, and BSCE - BS Computer Engineering, MS - Master of Science, MBA - Master of Business Administration, MSCS - MS Computer Science, and MSCE - MS Computer Engineering, Phd - Doctor of Philosophy, Phd Computer Science. 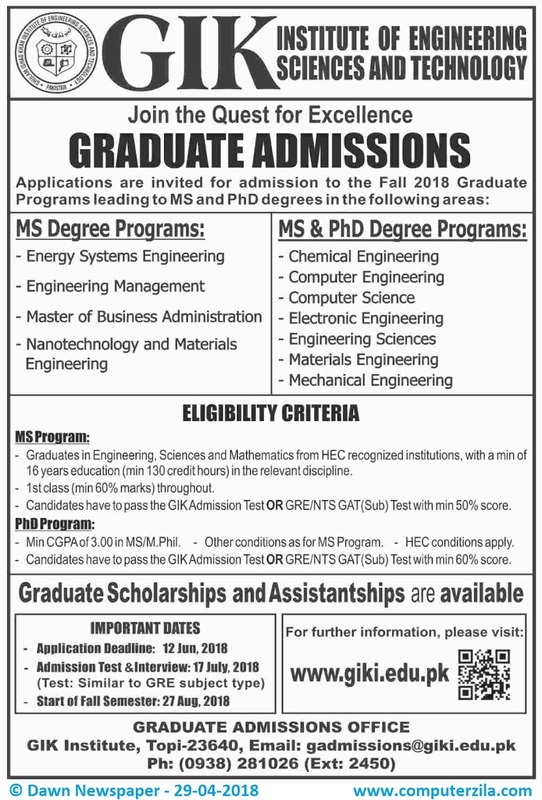 Ghulam Ishaq Khan Institute of Engineering, Sciences and Technology is one of the top most Engineering institution in Pakistan, Graduate Scholarship and Financial Assistant-ships are available. Graudates in Engineering, Sciences and Mathematics from HEC Recognized institutions with minimum 16 years of education in the relevant discipline, Pass GIK Test or GRE/NTS GAT (Subject) Test with minimum 50% or above. Minimum CGPA 3.0 in M.Phil / M.S. other conditions as for MS Program, HEC conditions Apply. candidates pass GIK Admission Test or GRE / NTS GAT (Subject) test with minimum 60%.